Barbecue. You know what it means, right? Are you sure? Having grown up in Rhode Island I always thought a "barbecue" referred to an outdoor cookout featuring grilled hot dogs and hamburgers. It wasn't until we moved to North Carolina that we discovered "barbecue" had nothing to do with hot dogs and hamburgers and everything to do with slowly cooking a whole hog over some flames. Now that we live in Southern California, I've fallen for Santa Maria-style barbecue made from tri-tip, a flavorful, triangular cut of beef from the bottom sirloin. Santa Maria-style barbecue originated in the Santa Maria Valley in Central California in the 19th century. After cattle round-ups, American cowboys, known as vaqueros, would host huge gatherings that featured beef skewered and cooked over a red oak fire. The beef was simply seasoned with salt and pepper and served with Pinquito beans, salsa, bread, and simple desserts. It hasn't changed much in almost two centuries. 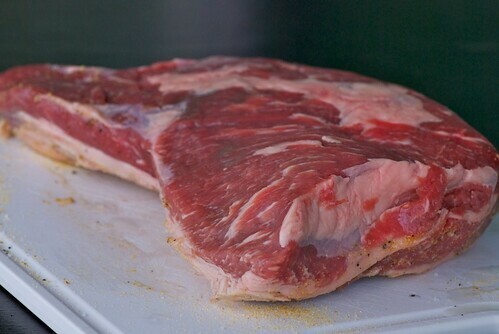 Below is Joe’s recipe and instructions for his authentic Santa Maria-style tri-tip. It’s long, but just read it through first before doing anything, and you’ll see, it’s really not complicated, just very detailed, and oh-so-worth the effort. The finished tri-tip is unabashedly rich, tender, and juicy. And just in case you're wondering, tri-tip tastes better if it you eat it while wearing a cowboy hat. Did you remember to fill your grill's gas tank? Hope so . . .
20 to 30 minutes before you want to start cooking, clean the grill, turn the temperature to its highest settings, and close the lid. If possible, it should reach 750F at grill level. You can tell without an infrared thermometer by doing this: if you can put your hand 3" above the grill and count to 3, it's not hot enough. Remove all layers of fat, fat chunks, and silver-skin from the tri-tip. Make sure to remove the fat from the pocket on the short side of the triangle. When removed, there will be a deep pocket there. Discard the fat (or use it for tallow). The only visible fat remaining will be tiny specks and streaks of fat, which are too small to trim and which will melt quickly on the fire. Dry the tri-tip with paper towels (including inside the pocket). Bring it to room temperature. If you're doing this alone, use one hand (I use my left) to get "dirty" holding the tri-tip and rubbing in the rub, and use the other hand (I use my right) to pour on the ingredients. (a) Pour a thin layer of vegetable oil on the outside and into the pocket of the tri-tip. Then rub it all over fairly evenly (with the 'dirty' hand). The only purpose of the oil is to make sure that the seasonings stick. (b) Next, pour a very thick layer of garlic powder on the top. (If you're using fresh garlic, rub in several cloves of fresh garlic all over, leaving a thick layer of paste.) The tri-tip should be almost completely yellow with the garlic powder. (c) Now pour lots and lots of black pepper on the tri-tip. Rub it in gently (so that it coats the tri-tip). If the pepper begins to fall off, pour a little more oil into your 'dirty' hand, and "pat" the oil onto the tri-tip, so that the pepper sticks. If you've used enough garlic powder and pepper, there will be one or two tablespoons extra in the bottom of the dish. The tri-tip should be almost completely black with the pepper. (d) Finally, you're ready for the Kosher salt. Usually, I have to add more oil at this point, so that the salt will stick. Add lots of salt, so that the surface is white with lots of black-pepper highlights and the occasional yellow background. 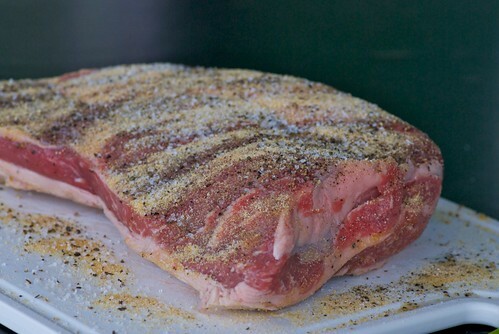 The idea is to create a thick layer of seasoning on the outside of the tri-tip, that will create an exterior with a dry, crunchy texture and intense flavor profile, to contrast with the lush, beefy, juicy interior. Now use your 'dirty' hand to flip over the tri-tip, and repeat the process from (a) through (d). There is usually enough seasoning in the bottom of the pan to start the second side, but you'll probably have to add more of each. Again, don't forget to season the pocket and the three edges of the triangular tri-tip. When you're ready to start grilling ready, set your iPhone's (or your kitchen) timer for two minutes. You're going to flip the tri-tip from one side to the other every two minutes during the cooking process. Put the tri-tip on the grill (use tongs, not a fork, to prevent loss of juices) and close the lid as fast as possible. Start your timer. Don't peek. After two minutes, quickly open the grill, flip the tri-tip and close the lid. Continue to do this for a TOTAL of 8 minutes (rare - my fav) or 10 minutes (med-rare). If your grill isn't hot enough (I'll bet it isn't), the tri-tip will take up to twice as long. Use an instant read thermometer (or two of them, which is better in case one if off - just average the two thermometers) to tell when the tri-tip is done. Take it off at 115 (rare) or 125 (med rare), measured in the middle of the tri-tip Insert the thermometer(s) from the side of the tri-tip, so that they go into the center. Put the cooked tri-tip onto the rack, and cover it with a "tent" of aluminum foil. The goal: don't let the foil touch the tri-tip, because you don't want to lose that exterior crust that you worked so hard to create. Let it rest for 5 entire minutes. (This will total about 7 minutes by the time you start slicing: that's a good thing.) Now move the tri-tip to your cutting board. Using a very sharp knife, cut slices about 1/8" thick (i.e. thin) across the grain. The tri-tip has a strange grain structure -- hard to explain, but you'll know it when you see it. You'll be cutting almost perpendicular at the point of the triangle and then angle in more and more as you reach the middle of the triangle. Watch for the meat grain, and you won't have any problem. If your cutting board has a little juice from the cutting, dribble it only your serving platter. For more information about steak, visit www. 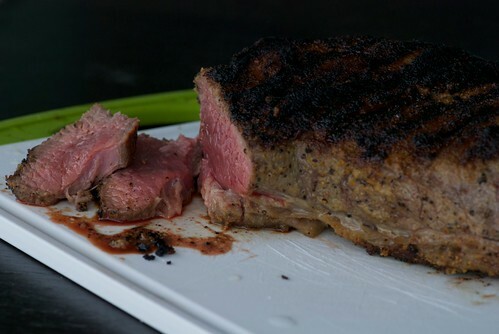 SteakPerfection.com. Top photo credit: FCC, randy pertiet. Remaining photos, Susan Russo. I like the weather factors listed in the recipe, and of course, the succulent results! That looks like the perfectly barbequed piece of meat. wow, that is cooked to PURRRRfection and what a LOVELY first picture. I'm a SoCal girl originally and now live in NC. It's rare that I get to have some good tri-tip. The south knows nothing about a deep pit barbecue. Thanks for the recipe to try out on my grill! I love tri-tip and this recipe sounds wonderful! Wow -- how can you go wrong with a recipe this precise? Now if only I can find tri-tip in the markets here in the homeland (Rhode Island). I went to the wine country once where they were giving sample of tri-tip bbq. I had no idea what it was but thought it was one of the most delicioius things I had ever eaten. I'm so excited to see this recipe now. thanks. jennifurla- The first one's not mine, but isn't it splendid? stf- And I used to live in NC and now live in SD! Don't tell my SD friends, but I miss NC BBQ. lydia- You might want to look for round tip roast. marie- I hope you give it a try. Speaking of wine, it's great with a red Zinfandel or a Pinot Noir. What a beautiful piece of meat! Perfectly cooked. We did not have tri-tip in Ohio and I have never cooked with it. I tried tri-tip sandwich (obviously a Brazilian specialty) a while ago in Berkeley and loved it! I do almost the same, but first take the salt, pepper and garlic and add just enough oil to make it a loose paste. Then rub this all over the tri-tip - works like a charm! lana-How about you bring the meat to a friend's house that has a good grill? You make the tri-tip, they make the beans. It'll be a win-win. PS-Don't forget some good beer! chef tommy-Thanks for the tip! Sounds great. When I lived in Silicon Valley we use to drive south to Nipomo (just north of Santa Maria) to a steakhouse called Jocko’s for Santa Maria style barbecue. It was a three hour drive and the place is a zero décor wise, but the steaks are so worth it. They cook their steaks over screaming hot oak seasoned with garlic powder, salt and pepper and nothing else…perfect. Your steak brings back great memories. Have you actually been to Santa Maria to have their BBQ? I went to school in SLO and have had quite my fair share of tri-tip. Every weekend was a BBQ - the aggies sure know how to cook a great piece of meat! dominica-Yes, I have, and I can't wait to go again! I could breath in the meaty smoke all day! Being a Santa Maria native, I have also worked at a Steakhouse in Santa Maria that is a Santa Maria Style BBQ steakhouse. Open since 1953, and I must say this recipe looks good however it has NOTHING to do with Santa Maria style BBQ/grilling. First off, you need to leave a layer of fat on the fatter side of the roast. DO NOT trim it all off as this recipe suggests. Also, if you want the true S.M. style you need a crank-style pit and some red oak. NOTHING BUT RED OAK should be used in S.M. style BBQ. If you don't have access to an Oak pit I would recommend a charcoal grill with some red oak chips to throw on top of the coals to get that smoky flavor. Also you should only flip a tritip ONCE. Start cooking it fat-side down (because you didn't trim all of it off). And flip it once about 25-30 minutes through. It should be done in 45 minutes to an hour. Serve it with a mexican style salsa, garlic bread, pinquito beans, and a small salad. And you have the quintessential S.M. style meal that I enjoyed much of my life on summer weekends driving up and down broadway hitting up the fundraiser BBQs. This steak perfection guy might think he knows, but it sounds like he made this up, or has never been to S.M.